Cross and “Bar Code” At Avebury Down Near Avebury, Wiltshire. Large cross pattern and “bar code” in upper left reported September 28, 2008, in maize (corn). Estimated length is 700 feet. Aerial image © 2008 by Tammi Paxman. 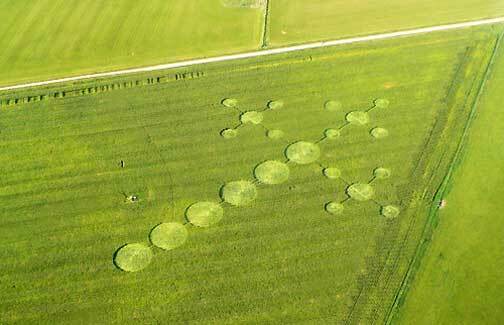 October 1, 2008 Avebury, Wiltshire, England - Cropcircleconnector.com received the following email report on September 28, 2008, about a new formation seen from the air at Avebury Down near the ancient stone circles of Avebury, Wiltshire. Next PostNext Mother and Son Watched Cow Rise In Golden-Orange Beam to Disc.